The main ingredient in Anicare Gel is Arnica Montana. Arnica Montana is a mountain plant from the daisy family and its healing properties have been used for centuries. Relieving muscle aches & stiffness, due to minor injuries, overexertion, falls, and blows. 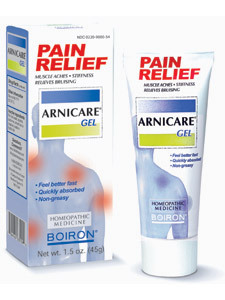 Recommended by doctors, plastic surgeons and pharmacists, Arnicare Gel is used by professional athletes for its cooling effect & fast pain relief. Arnicare Gel is non-greasy, non-sticky and quickly absorbed into the skin. It is completely Paraben Free.